Summary of the project: Our comms campaign got companies in Recife to hire previously homeless adolescents, persuading them that they can make a positive contribution to their business. 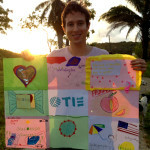 Dylan’s inspiration for getting involved with TIE was his sister Amber, who was adopted as a baby from Bogota, Columbia. Last year they visited the incredibly poor community she cam from – it was the first time she had returned to Colombia. Dylan wanted to help children born into similarly desperate conditions. The NGO that Dylan worked with is called O Pequeno Nazareno. They fight for the basic human rights of homeless children in Recife, helping to rehabilitate them at their retreat so that they can get clean of drugs (particularly crack) and be reintegrated into Brazilian society. The objective was to raise awareness of the NGO’s work among local businesses and encourage them to interview (and hire) these young apprentices from the NGO. Not easy: but also not impossible. The experience was a fantastic one – on many levels. Not only did Dylan and the local agency Melhor create an amazing campaign that got serious results, but it also made a genuine difference to everyone involved: the young people, the community, the NGO, the local agency and Dylan. To learn more about the project, the results, and the overall campaign, click on the case study link above, or click here. You’ll be happy you did.